Since she started teaching, Françoise Pollet has been trying to pass on the technique her own professors gave her, as well as the knowledge she learned throughout her career. On top of her teaching classes in the CNSMD of Lyon, she gives numerous Masterclasses, allowing her to work with different artists. At the Opera-Studio of Strasbourg, where she worked with the Young Voices of the Rhin. At the Académie Maurice Ravel of Saint Jean de Luz, de 2003 à 2006. 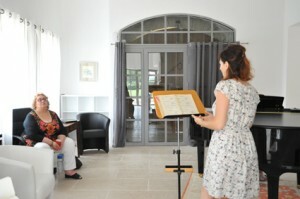 At the Académie Internationale de Musique Lyrique Française of Maestro Michel Plasson in July 2014. At the Domaine de Bayssac in September 2015.